Halifax Seamless Guttering is owned and run by Alpine Roofing & Maintenance Ltd, based in Halifax. We are a professional, family run business, which has been established since 1998; Our aim, is to provide all customers with a friendly, professional, cost effective roofing & guttering service. All our employees within our company are skilled roofers and are focused to provide all clients with a high quality level of workmanship and customer service. All our work is carried out to the highest standard, using quality materials that we guarantee to last. Halifax Seamless Gutters only use the Mustang® seamless aluminium gutter system; The only aluminium seamless gutter system approved by the BBA. 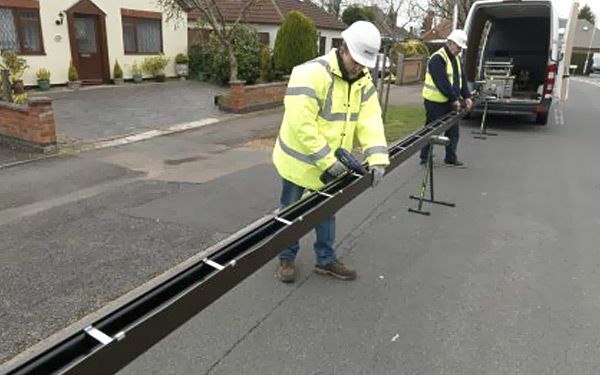 Gutters are roll formed on site in lengths of up to 30 metres. It is a unique system with no joints, meaning no leaks, creating a neat, maintenance free product of the highest quality, giving you peace of mind and the added extra of the visual appeal of smooth neat lines. Manufactured from 90% recycled aluminium, which can be further recycled once it has reached the end of its useful life – it really is an environmentally friendly product. Aluminium guttering comes powder coated and is available in Black, Brown, White & Anthracite grey. We also supply & install aluminium rainwater pipes, hoppers & fittings. We offer a range of sectional and cast aluminium guttering, aluminium fascia boards, cladding, hoppers and one-off designs..
We provide a range of roofing & gutter maintenance services for all types of businesses; we regularly work with Schools, Building contractors and all types of Commercial & Industrial businesses; including high level access. Whether you’re looking for new PVC guttering, rainwater pipes, fascia, soffits or barge boards, our range of products are made from high quality materails guaranteed to last. We also supply and install bespoke aluminium roofline products. Please call 01422 346464 to book your free site survey or you can send an email using our contact us form.